In 1993, a second Phantom title was launched, a reprint magazine with only "historical" Phantom stories, ie. stories about the ancestors of the current Phantom. The idea came from Denmark and Norway where such magazines had first appeared in 1986 and 1989, respectively. The difference was that the Swedish edition published all historical adventures, in chronological order (the order in which the stories take place), whereas the Norwegian/Danish versions usually only did one issue per ancestor with a selection of stories in each case. The Swedish Krönika was an immediate success. 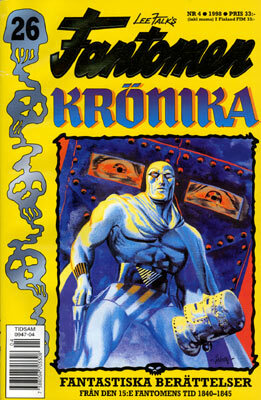 It attracted older readers who had left the Fantomen magazine when colour was reintroduced in 1991, as well as new fans. 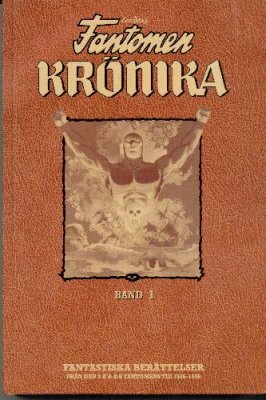 From 1993 to 1996, the Krönika was published quarterly, and since 1997 it has been published bimonthly. When all stories about the Phantom generations from 1 to 20 had been published in 2001, they started over again from Nr.6/2001 with historical stories that had been created in the meantime. Occasionally there are also special "Theme" issues, for example an issue with stories about Hero, and one about Diana. The stories are often edited (sometimes down to only a few pages), so they only consist of the actual historical episodes. The first ten issues also contained specially made short Phantom episodes, telling the story about the 21st Phantom going through the old chronicles and transferring them to computer discs! These short stories are listed in the following table and are identified with the code letters FK. Format: b/w, 170 mm x 260 mm, gold foil on cover logo, square-bound. All covers feature painted art by Hans Lindahl. 1The cover of Nr. 5/2003 was a reprint of the cover of Fantomen Nr. 8/1989. By public demand, a reprint series started in 1999. A full year of chronicles are compiled in each hardback book.